We’d love your help. 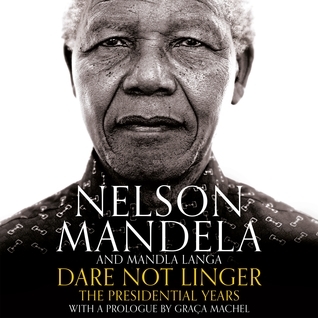 Let us know what’s wrong with this preview of Dare Not Linger by Nelson Mandela. In 1994, Nelson Mandela became the first president of democratic South Africa. Five years later, he stood down. In that time, he and his government wrought the most extraordinary transformation, turning a nation riven by centuries of colonialism and apartheid into a fully functioning democracy in which all South Africa’s citizens, black and white, were equal before the law. To ask other readers questions about Dare Not Linger, please sign up. This is the long-awaited second volume of the autobiography of Nelson Mandela. It has been put together from what he had written before his death, and from his notes. It has been edited with great skill, devotion and commitment by Mandla Langa, the author of “Lost Colours of the Chameleon” and a number of other books. Here, I have to confess that Mandla Langa has been my friend for more than thirty years, since he came into exile in the UK following the Soweto Uprising of 1976. During that time, This is the long-awaited second volume of the autobiography of Nelson Mandela. It has been put together from what he had written before his death, and from his notes. It has been edited with great skill, devotion and commitment by Mandla Langa, the author of “Lost Colours of the Chameleon” and a number of other books. Here, I have to confess that Mandla Langa has been my friend for more than thirty years, since he came into exile in the UK following the Soweto Uprising of 1976. During that time, Mandla took a leading role in the cultural activities of the ANC, and I was one of the chair-people of the London Committee of the Anti-Apartheid Movement. The first time that I met Nelson Mandela was, with Mandla and others, at Madame Toussaud’s in London when his waxwork was being unveiled. So that is my colours nailed to the mast. As someone who was closely involved in the Anti-Apartheid Movement and in some of the events described in the book, I cannot be described as a neutral observer. This book approaches those events of the 1994 first democratic elections in South Africa and the first few years of the transition process from the perspective of Nelson Mandela. That is what makes the book fascinating. Nowadays, people regard it as some kind of miracle that Mandela was able, during his Presidency, to end the years of conflict in South Africa. It was not. It was the result of very hard work and of a deep political understanding of what needed to be done. It was Nelson Mandela who did that. This book is an analysis of that process, of the threats, the dangers, the angers and resentments that had to be negotiated so that South Africa did not descend into civil war. It describes, from the inside, what was a remarkable achievement. But it was not a miracle. It did not come out of the blue. It came about because Nelson Mandela understood what had to be done, and then found ways of achieving it. The first threat came from those who did not want to participate in the election or who were pretending that they did not wish to participate in order to gain an electoral advantage. The threats came from the extreme white right wing and from Chief Mangosuthu (known as Gatsha) Buthelezi’s Inkatha Freedom Party. Neither threat was negligible – they could have led to civil war. It needed Nelson Mandela to exercise a great deal of skill and patience to neutralise them. It was Mandela who steered South Africa through the Afrikaner Weerstand Beweging (AWB) attack on the negotiators at the Conference for a Democratic South Africa (CODESA), the massacres at Bisho and Boipatong, the assassination of Chris Hani, the AWB attack on Bophuthatswana and a host of other events. It was Mandela who persuaded General Constand Viljoen of the Freedom Front that his organisation should register to take part in the election. It was Mandela who contacted Buthelezi and, despite opposition from recalcitrant in the ANC, such as Harry Gwala, set about asking the Inkatha Freedom Party to join the elections. At many times, and especially following the murder of Chris Hani, South Africa was on the brink of a civil war. It was Mandela who avoided all these disasters. It was his leadership that made the difference. To find out how, you must read the book. Of course, Mandela did not achieve any of this on his own. There were many people who assisted him. There were many more who were persuaded by him. There were some, like Robert Van Tonder and Boere Weerstand Beweging, who refused to be persuaded but they were few and far between. Fortunately, Mandela was able to neutralise them, but not enough to prevent them killing people with the bombs that they exploded during the election campaigning and on the election days themselves. Of course, it was a collective effort but it was Mandela who provided the leadership. That is now generally acknowledged. That is part of the story of this book. Nor did the danger pass with the election. I distinctly remember standing there in South Africa House in London on 10th May 1994, wondering whether the South African Air Force would strafe the guests at the Presidential inauguration. That this did not happen was partly because my imagination was over-active but also partly because Mandela had convinced the generals to give the new South Africa a chance to survive. There was a huge effort that had to be put into nation-building, and this is what Mandela made the theme of his Presidency. He made huge efforts at nation-building, in creating a constitution, in establishing the role of Parliament, in establishing the role of the traditional leaders in a democracy, and in transforming the state. These are the themes of the chapters that take up the tale following Mandela’s swearing-in as President. Most important, however, was the theme of reconciliation. Mandela however was careful not to let people off the hook. He was the driving force behind the Truth and Reconciliation Commission. He made it necessary for apartheid officials to state clearly what they had done before they could be granted amnesty. It was difficult. There were people who refused to apply to the Truth and Reconciliation Commission because they knew that any evidence against them had been destroyed. There were people who did not believe in the Truth and Reconciliation Commission because they wanted the perpetrators to be prosecuted and go to prison. Mandela recognised that this was not going to happen because the burden of proof was on the prosecution. He sought a way in which the relatives of victims could find out what happened to their loved ones. It proved to be cathartic. There were some, like Craig Williamson, who were not penitent, but the recognition of the grief of so many did help the healing process, or, at least, that is the argument that Mandela would have put forward. The last chapter is about Mandela on the African and the World Stage. Mandela served as an honest broker for his continent. He was able to help resolve the difficulties in countries such as Rwanda and Zaire. He was able to resolve issues like the prosecution in relation to the Lockerbie bombing. He was feted throughout the world. My particular memory was of Mandela’s State Visit to London in 1996, where he not only spoke to both Houses of Parliament but visited the black community in Brixton. This book is about the contribution that Mandela made during his Presidency to the healing of the wounds caused by apartheid. It is a book about the contribution of one man. He was not a saint. He made mistakes, which are discussed in this book and which he himself recognised. It is an important book because it discusses how an icon dealt with the issues in front of him. It discusses how he became an icon. It is a clear assessment, based on the writings of the man himself, about the contribution that he made. For that reason it is astonishing, and that is why you should read it. "El color de la libertad" narra los años presidenciales de Nelson Mandela durante el primer gobierno democrático de Sudáfrica. Es edificante ver su paciencia, su compromiso y su lucha para lograr el respeto a la dignidad de toda persona humana y a sus derechos. Sus ideales, los objetivos que propuso y las metas que durante su gobierno logró alcanzar son admirables. Mandela was an incredibly interesting person who lived an extraordinary life. I was not particularly thrilled with t "I have discovered the secret that after climbing a great hill, one only finds that there are many more hills to climb. I have taken a moment here to rest, to steal a view of the glorious vista that surrounds me, to look back on the distance I have come. But I can rest only for a moment, for with freedom comes responsibilities, and I dare not linger, for my long walk is not ended." Like others I had hoped we'd have more of Mandela's thoughts after reading his 'Long Walk to Freedom' and this book is the second part of his memoirs. Compiled from his notes and texts, this is based off the writing he had started but unfortunately had been unable to finish. Apparently he ended up writing about ten chapters about his time in office but abandoned the work. So the rest was compiled together from Mandela's notes during his term, the original draft of the work, plus additional infor Like others I had hoped we'd have more of Mandela's thoughts after reading his 'Long Walk to Freedom' and this book is the second part of his memoirs. Compiled from his notes and texts, this is based off the writing he had started but unfortunately had been unable to finish. Apparently he ended up writing about ten chapters about his time in office but abandoned the work. So the rest was compiled together from Mandela's notes during his term, the original draft of the work, plus additional information to give the reader context to Mandela's rise and the political and historical context of the time. Unfortunately this shows. I'm reminded of another attempt by another author to create an autobiography of Martin Luther King, Jr. using similar methods (compiling a text based off of the subjects words, interviews, texts, etc.). I understand the impulse but like the MLK book this one just can't capture Mandela either. 'Long' required a slow reading which I was fine with because Mandela made it interesting and I was interested in his story. It just doesn't quite work here, although as a reference I'm sure others will find it very valuable. Maybe I wasn't in the mood for a book like this or it's just not the right time for me. I loved Long Walk to Freedom and I had high expectations for this book. It was just factual and I didn’t feel much emotion reading it. It did however provide a reminder of what a wonderful leader Mandela was, and I found it hard to believe he belonged to the same ANC that we know today. This book does not come near Long Walk to Freedom. Wanneer je aan een biografie van Mandela begint, weet je dat het verhaal iets anders zal gaan dan wanneer je Keith Richards of Gijp leest. Mandela fascineert me al vele jaren, graag duik ik in zijn eigen verhaal. In het voorwoord blijkt al dat dat niet helemaal klopt. Toen hij president werd, maakte hij vele aantekeningen, het uitwerken kwam hij niet meer aan toe. Mandla Langa heeft er een boek van gemaakt. Maar al snel raak ik in verwarring. Wanneer is Langa aan het woord en wanneer Mandela? He Wanneer je aan een biografie van Mandela begint, weet je dat het verhaal iets anders zal gaan dan wanneer je Keith Richards of Gijp leest. Mandela fascineert me al vele jaren, graag duik ik in zijn eigen verhaal. In het voorwoord blijkt al dat dat niet helemaal klopt. Toen hij president werd, maakte hij vele aantekeningen, het uitwerken kwam hij niet meer aan toe. Mandla Langa heeft er een boek van gemaakt. Maar al snel raak ik in verwarring. Wanneer is Langa aan het woord en wanneer Mandela? Het is niet de biografie die ik verwachtte, het is een boek over Mandela waarin hij zelf aan het woord komt. Nuanceverschil. Dare Not Linger allows for Mandela’s thoughts on certain political matters - which weren’t previously known - to come to the forefront. He had a strained relationship with former president FW de Klerk, and reading the book allows us to see just how frustrated Mandela was. We also learn about Mandela’s marriage breakdown with Winnie Mandela, and the strain that this put on Mandela’s role as the President. This book is dense and requires a fair bit of effort to read. I only recommend this to readers who are genuinely interested in his presidential years (because that’s really all this book covers - it rarely talks about anything else but politics). Overall, it’s really inspiring to read this because Nelson Mandela was a truly unique leader. It deals with Mandela’s period in office as the first President of post-apartheid South Africa (1994-1999), and the manuscript for what became this book was begun by Mandela himself, writing ten chapters, and has been expertly completed by Mandla Langa using those ten chapters and other materials left by Mandela, so that roughly a third of the text is autobiographical. It is easy to forget just how many problems South Africa faced when Mandela took charge. Fragile national unity could have easily fractured irrevocably given the often widely divergent aims of Mandela’s African National Congress, de Klerk’s National Party, Chief Buthelezei’s Inkatha Freedom Party and the Pan-Africanist Congress. Any white flight would have jeopardized economic growth whilst continued white dominance of the army and police, especially in its upper reaches, would only breed increased resentment on the part of the black majority given the institutionalized racism of the past. Not only was the past poisonous but the future was equally problematic given inflated expectations of rapid reforms in housing, health and education for the black masses as well as plentiful potentially destabilizing rhetoric regarding the redistribution of wealth. The South Africa which Mandela passed on to Thabo Mbecki (although the book shows he personally favoured Cyril Ramaphosa as his successor) was very far from perfect but was much more politically stable than would have been the case without Mandela’s inspired leadership, which shines through this text. I do not regret picking up the book even though I once told myself I will not bother with any Mandela book. I can say the book chose me as a colleague, who is not a reader, decided to lend me the book. It is about the late Nelson Mandela's years in office as the first democratically elected President of South Africa. Even though completed by now Dr. Mandla Langa, I did not feel at any point reading a different voice. Highlights were insights into Mandela's mind as far as his thinking was concern I do not regret picking up the book even though I once told myself I will not bother with any Mandela book. I can say the book chose me as a colleague, who is not a reader, decided to lend me the book. It is about the late Nelson Mandela's years in office as the first democratically elected President of South Africa. Even though completed by now Dr. Mandla Langa, I did not feel at any point reading a different voice. An enlightening account of the early democracy period, told from the perspective of the noble Madiba. A must read for all South African millennials as it provides clarity on a period many of us were too young to know or remember, but the clarity, facts and history are parts of our past that must be known and understood to appreciate our present reality and freedom; as well as to understand the root cause to our socio-economic problems of poverty and crime. Written in the format of chapters and se An enlightening account of the early democracy period, told from the perspective of the noble Madiba. A must read for all South African millennials as it provides clarity on a period many of us were too young to know or remember, but the clarity, facts and history are parts of our past that must be known and understood to appreciate our present reality and freedom; as well as to understand the root cause to our socio-economic problems of poverty and crime. (A copy of this review can also be found here: beautifulilies.wordpress.com/2018/04/05/dare-not-linger-the-presidential-years-by-nelson-mandela-and-mandla-langa/). It's always difficult finishing the works of someone who has since passed, but Mandla Langa does a great job. That said, Dare Not Linger does still rely heavily on factual information which is in complete juxtaposition to the emotion in Long Walk to Freedom. 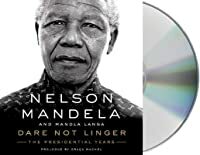 I would recommend this biography more for people who are heavily invested in po (A copy of this review can also be found here: beautifulilies.wordpress.com/2018/04/05/dare-not-linger-the-presidential-years-by-nelson-mandela-and-mandla-langa/). An excellent look at Mandela's presidential years. There are definitely a lot of acronyms and names that would not be familiar for North American readers, which can make it tough to follow what is going on. It truly is an amazing experience to reflect on the life and the leadership of a great (but not perfect) man who helped usher in a new area of peace. I love his focus on reconciliation, which was practical, but also an amazing commitment to the sanctity of the human spirit and the humility it An excellent look at Mandela's presidential years. There are definitely a lot of acronyms and names that would not be familiar for North American readers, which can make it tough to follow what is going on. It truly is an amazing experience to reflect on the life and the leadership of a great (but not perfect) man who helped usher in a new area of peace. I love his focus on reconciliation, which was practical, but also an amazing commitment to the sanctity of the human spirit and the humility it takes to recognize that we are all flawed. As always, I am at awe of Nelson Mandela and his character and the change he has made to his country. I found this biography format a bit dry in that a lot of the facts went over my head, but overall I understand the progression of this text. The best parts were Nelson Mandela's original writings and the transcripts of some of his speeches. This book has great insight on South Africa and is highly informative and inspiring. His collaborator took Mandela's notes for a book about his Presidency and put this together. Again fascinating to hear his thought processes and to learn more about this fascinating country. Probably not as interesting to someone who doesn't know so many people continually impacted by decisions and policies from that time. Sad to see how some of his progressive ideas have been subverted with less statesmanlike leaders. I absolutely loved Nelson Mandela's first book Long Walk to Freedom. Unfortunately, Dare Not Linger was cobbled together from Mandela's unfinished book on his presidency, his speeches, and the gaps were filled in by another writer. I have no problem with that. The problem with this book is that it has a non-linear structure. In films and novels, this style lends an air of mystery. In a biography, it feels poorly edited. There's good material here but it was a chore to get through. Interesante el conocer la manera de pensar que tuvo que adoptar Mandela para empezar a construirse en la prisión para llegar a ser presidente, construirse camino en esos nuevos tiempos políticos, crear confianza y seguridad a tantos diferentes actores, construir alianzas estratégicas; pero principalmente muy interesante como se mantuvo fiel a si mismo durante el largo y sinuoso camino que le tocó vivir. I enjoyed listening to this book. It taught me a lot about apartheid as well as Mandela's presidency. It is very accessible to those who do not normally read nonfiction. I liked that it was not entirely told from Mandela's point of view. It was nice to get all of the background information. It made it a lot easier to follow along with what was happening. The only thing that i had a problem with was that it was told out of chronological order and jumped around from event to event. This review is in response to an online copy received through Netgalley. I didn't find this book as engaging as the previous book "Land of My Father" though there is no doubt that it is extremely informative to the point that it almost reads like a textbook. I'd recommend this book for anyone who is interested in the politics of South Africa. This is an ARC giveaway from Goodreads.com. Mandela's Presidential years are reviewed in this work. A first draft of ten chapters by Mandela are the basis for this work. Other coworkers and speeches from Mandela fill this out. Adrian Lester who narrates the audio book does an impersonation of Mandela in the sections when he reads his own words. I loved learning more about Mandela’s inspiring leadership, but this account is a mix of Mandela’a first-person account and a third-person narrator. In an effort to seam the two together, it often made for a clunky read. I really value the aim to tell the story as much as possible in Mandela’s own words; I’m less certain this attempt achieved cohesion. Still, inspiring and informative. The positives about this book was reading things that you never knew about during Mandela's time as SA president, the negatives about it were that some of it was extremely dry and boring because you'd never heard of it as it was a SA issue and not necessarily a global one. Still an enjoyable book to read though. While there was some valuable insight in this book, about Mandela, Winnie, the new SA, it was dense and filled with names and details that did not always seem to link to the point. Interesting but not approachable. Part autobiography (the parts written by Mandela himself) and part hagiography (the parts written by Mandla Langa). Better books have been written about this great man. This one didn’t have anything new. Interesante biografía de Mándela en sus años de gobierno. Nelson Rolihlahla Mandela was a former President of South Africa, the first to be elected in a fully representative democratic election, who held office from 1994–99. Before his presidency, Mandela was an anti-apartheid activist, and the leader of the African National Congress's armed wing Umkhonto we Sizwe. The South African courts convicted him on charges of sabotage, as well as other crimes com Nelson Rolihlahla Mandela was a former President of South Africa, the first to be elected in a fully representative democratic election, who held office from 1994–99. Before his presidency, Mandela was an anti-apartheid activist, and the leader of the African National Congress's armed wing Umkhonto we Sizwe. The South African courts convicted him on charges of sabotage, as well as other crimes committed while he led the movement against apartheid. In accordance with his conviction, Mandela served 27 years in prison, spending many of these years on Robben Island. In South Africa he is often known as Madiba, an honorary title adopted by elders of Mandela's clan. The title has come to be synonymous with Nelson Mandela.